When you get an allergy shot, your allergist or doctor injects small doses of substances that you are allergic to (allergens) under your skin. This helps your body "get used to" the allergen, which can reduce or prevent symptoms. At first, you may need to get allergy shots once a week and then once a month. It may take up to a full year of shots before you see any change in your symptoms. The allergy shot may cause mild problems, such as soreness, redness, warmth, or swelling on the arm where you got the shot. It may also cause itching, hives, or a rash that spreads to other parts of your body. Do not smoke or allow others to smoke around you. Smoking makes allergies worse. If you need help quitting, talk to your doctor about stop-smoking programs and medicines. These can increase your chances of quitting for good. If there is a lot of pollution, pollen, or dust outside, stay inside and keep the windows closed. Use an air conditioner when it's hot outside, and use an air filter in your home. Do not use any blankets and pillows that you do not need. Consider removing drapes and carpets, which attract and hold dust, from your bedroom. If mould triggers your allergies, get rid of furniture, rugs, and drapes that smell musty. Check for mould under sinks and in the washroom, attic, and basement. Use a dehumidifier to control mould in these areas. If pet dander triggers your allergies, keep pets outside or out of your bedroom. Old carpet and cloth furniture can hold a lot of animal dander. You may need to replace them. If your allergies are triggered by cold air, wear a scarf around your face, and breathe through your nose. Avoid colds and flu. Get a pneumococcal vaccine shot. If you have had one before, ask your doctor whether you need a second dose. 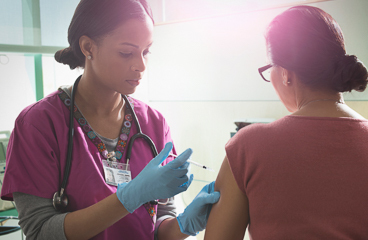 Get a flu vaccine every fall. If you must be around people with colds or the flu, wash your hands often. Enter G771 in the search box to learn more about "Allergy Shots: Care Instructions".